Norcross has been in the viscosity control business for over 80 years. During that time we have seen “best practices” in the industry come and go. Some have become the standard and some have been displaced by new practices or technologies. Often when I discuss “best practices,” I am not discussing anything new or revolutionary. Our customers already know most, if not all, of them. Most of these best practices require either a minimal investment or no investment at all. Many of you will look at some of them and say “we used to do that but ….” Most, but not all, are based on ink management. It is no coincidence, that’s what our business is based on. While I may not be telling you anything you don’t already know, I’m hoping this can inspire you to improve your existing process relatively simply and quickly. When ink is brought onto the pressroom floor, it may have been tested, adjusted, and mixed in the ink room. Over a relatively short period of time, the ink begins to settle. During this period the ink solids and the solvent separate. This may not have been a problem in the past when centrifugal pumps were the standard. Centrifugal pumps, by design, sat in the ink tank and had an impeller at the bottom of the tank. Mixing was inherent in the pumping process. As the industry has migrated to peristaltic and double diaphragm pumps, the mixing inherent in the pumping process has been lost. The ink is now just “pulled” from the tank without any of the mixing the industry was used to. This can lead to color variations and inconsistent laydown caused by stratification of the ink. In other words, you are not getting uniform coverage because the ink is not homogeneous. Let me use paint as an example. When you purchase a can of paint from your local home improvement center, the person at the paint counter takes the paint you picked, adds the tint, seals the can, places it on a high speed agitator, removes it, checks the color, and hands you the now correctly tinted paint can. Then he throws in one or two wooden mixing sticks. You may not use that paint for the next few days, so when opened it appears to be very thick. If you were to paint without first mixing the paint, it would go on very thick, be difficult to spread, would take a long time to dry, and you would end up using more paint than necessary. Were you to mix the paint prior to use, the paint spreads easier, dries faster and you are able to cover a larger area with the same volume of paint. The common solution is incorporating a small pneumatic agitator into the ink pail. This provides mixing of the ink in the pail as well as incorporation of the ink returning from the printing system. Bottom line, even distribution of pigments, dyes, and carriers is the key objective that mixing inks helps you achieve. This is often one of those “we used to do that but …,” issues. It’s quick, it’s simple, and it’s what I see the really great printers do. This is often as simple as taking a cup reading before introducing the ink into the process. 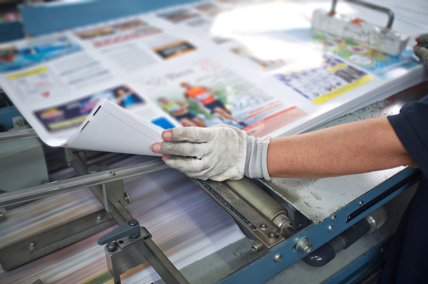 Relying on the assumption that the viscosity is correct when it comes to the press can mean that you will run your job on faulty information. Running a job with inconsistent viscosity can cause color variations, excessive ink usage, excessive solvent usage, etc. See our blog titled "10 Signs You Are Having Viscosity Related Problems" for a list of problems often related to viscosity. Having the tools ready, (which can be as simple as a cup and a stopwatch), can make the difference between a quality run and rework. If you are already doing this, you know the benefits and probably can’t believe everybody doesn’t do it. Well, I’ve been to a lot of facilities and I can guarantee you that not everybody is! The other thing I find is that the operators that are not doing this, often agree that they probably should be. Again, very simple to implement and minimal or no investment. The benefits, if not already obvious, include protecting the ink from contamination by particles in the air, managing the rate of solvent evaporation, and even protecting the ink from absorbing water from the humidity in the air. Adding the cover also provides a good place to mount the agitator. Again, simple stuff but it is a common theme I see among the great printers. The quality of temperature control in ink management is still in its infancy. Yes there are heat exchangers and temperature controlled rooms. Also, the great printers are looking more and more to temperature as a means to control viscosity and solvent evaporation. Unfortunately, the existing methods of temperature control are deficient in many ways. Norcross was purchased by Saint Clair Systems, Inc. in 2014. Saint Clair Systems’ entire business has been built on in-process, point-of-application temperature control. Since then, I have been gaining an education about process temperature control which has pointed out where these deficiencies exist. While the great printers are currently using some form of temperature control, they will undoubtedly improve as technology, and the industry progress. This is a great topic, with lots of opportunity for improvement, so rest assured there will be much more information on the future of temperature control in printing operations in upcoming blogs. The type of housekeeping I see amongst the best goes far beyond just keeping a tidy work area. At Norcross and at Saint Clair Systems, we employ lean manufacturing techniques – especially those related to the concept of 5S. For a nice summary of 5S, a definition, its benefits, and a free guide, visit Benefits of implementing the 5S Process. The benefits even include improvements in health and safety that go well beyond OSHA requirements. This may not be exciting but it is certainly what I have seen the great printers doing. That is really it. With minimal investment and a little bit of education and discipline, you can easily implement five of the best practices I see employed by the really great printers. Please subscribe to our blog by clicking here to ensure that you remain up to date on the progress of temperature and viscosity control development. EDITOR'S NOTE: This post was originally published in March 2016, but due to its popularity and relevance, we're sharing it again for anyone who may not have seen it. Download our free Viscosity Conversion Table to facilitate accurate conversion among Shell and Zahn Cup seconds, centipoises, SSU, SSF, and other viscosity units.